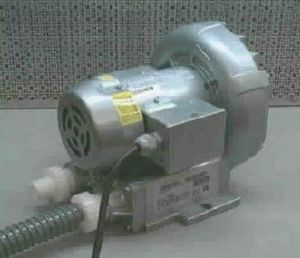 The ADS Aerosol Delivery System is a pump system used to transport test aerosol to positive pressure plenums upstream of HEPA filtration modules. The ADS comes complete with 3 metres of 1" flexible hose, 2 inlet / outlet hose adapters, a single phase power connection cable and an operators manual. IMPORTANT: An airtight connection must be made to the positive pressure plenum to ensure test aerosol is not blown back. Inlet MUST NOT be directly connected to the output of a thermal generator. An air space is required to ensure the proper formation of aerosol.